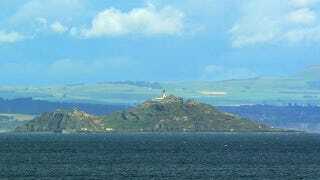 This is Inchkeith Island, the Scottish Isle with the least romantic history possible. Not only was it a quarantine island for the earliest cases of syphilis, it was also home to two kids who were subjected to a very creepy language experiment. James IV of Scotland enjoyed being a modern progressive king. Considering he lived in the 15th century, "modern" included things like keeping a court alchemist who, occasionally, glued hen feathers to wing frames and tried to use them to fly. "Progressive" included things like retaining that alchemist even when he flew down into a dung heap and broke his leg. So, clearly, James enjoyed the sciences. The problem was, things like the scientific process, experimental rigor, and informed consent weren't yet part of the sciences. So, when James decided he wanted to find out what the "original" language of human beings was, he came up with an interesting experiment. He took two babies, and a woman who was deaf and mute, and marooned them all on Inchkeith Island. His idea was that the woman would raise the children in silence until they were old enough to start talking, at which point people would find out what language they spoke. In doing this, he was probably consciously copying an experiment said to have been done by the Holy Roman Emperor Frederick II. Today James would have had a hard time getting experimental approval for that, as it was said that the babies that Frederick II had raised in silence all died. Some say that the children on Inchkeith died as well. Certainly, we have no trustworthy records of the outcome of the experiment. Sir Walter Scott believed that the kids probably imitated the sounds they heard, either coming from the woman or the local animals. Robert Lindsay of Pitscottie (who was born about forty years after the experiment happened) said that people told him that the kids spoke perfect Hebrew. Anyone who wants to try the experiment again will have to make arrangements with the car repair company owner who now owns the island and will probably have to provide their own children.